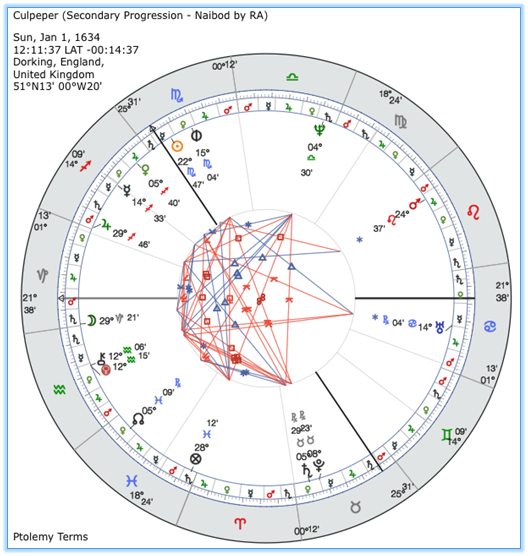 Historical natal charts is a post inspired by John Frawley’s lecture on Culpeper’s natal chart and subsiduary charts such as Solar Returns. 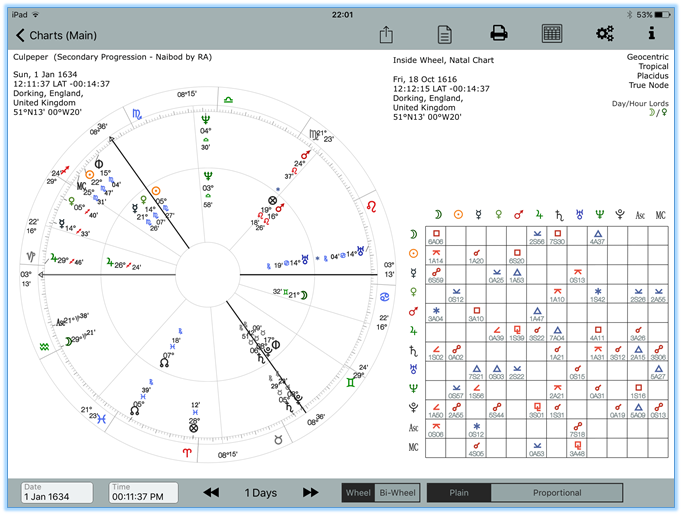 In this post, I look at the astrological charts that John talks about using AstroConnexions software. I wanted to ensure that AstroConnexions was capable of creating these charts. In my quest to do this, I had to update AstroConnexions with some specific techniques such as LAT (Local Apparent Time) calculation. In doing this, I had to compare my calculations with some of the extant software either freely available or commercial. I used my personal copy of Solar Fire and the free online astro.com website. Plus, of course, AstroConnexions. Teacher and practitioner of traditional astrology, John Frawley is the author of The Real Astrology (Spica Award, International Book of the Year), The Real Astrology Applied, The Horary Textbook and Sports Astrology. One of England’s foremost astrologers who studied under Olivia Barclay as did the author of this blog. John offers a series of lectures on Horary and Natal astrology at very reasonable prices. Available from his website. Please note I have no financial or affiliate connection or otherwise with John Frawley. I recently bought and downloaded Lectures 5-8 which consists of mp3’s and the relevant chart pdf’s, etc. These lectures are immensely enjoyable and would be of interest to any traditional astrologer. Recommended. Anyone who has read his books or his Apprentice magazine should know what to expect. 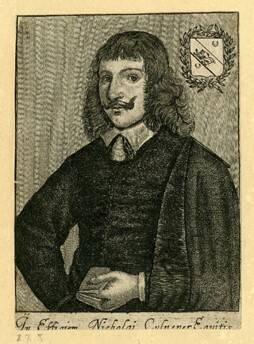 Culpeper was on his way to meet and elope with his love. He was met by someone who informed him she had been struck by lightning and was now dead! He then moves on to examining Culpeper’s Solar Return of 1633 in detail with a prominent place given to the Part of Fortune (POF) and the Part of Spirit (POS). Naturally, this examination also looks at the Solar Return’s relationship with Culpeper’s natal chart. He continues with an examination of various Lunar returns around and before the tragic event. 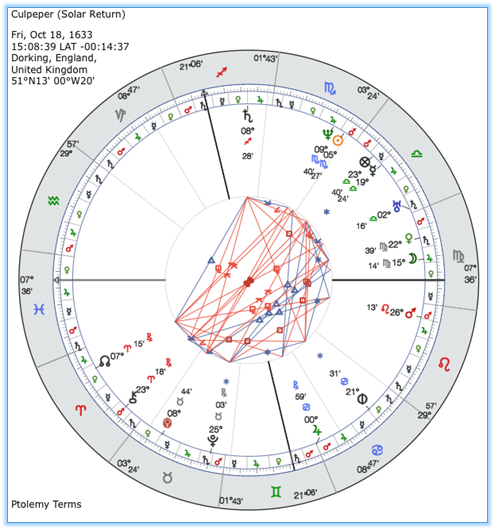 Why Solar Return Charts should be calculated for the natal place of birth and never relocated. Solar Return charts should never be precessed. That Uranus, Neptune and Pluto should be treated like fixed stars. And that’s just a few of his interesting discussions. Solar Return – Part of Fortune and Part of Spirit. John recommends using the Natal chart’s POF and POS and casting their places from the Solar Return ascendant. His name for this is Natal Arc Parts. He states that William Lilly did this. AstroConnexions has this capability as can be seen later in this post. He also insists that the diurnal or nocturnal considerations should not be taken into account when calculating these parts ie they should not be reversed depending on whether the chart is a day or a night chart. He refers to the POS as the Part of Abundance, and the Super Sun. I won’t describe any more from the lectures as I don’t want to disclose too much and spoil the experience in listening to John. There is much to learn and discover in his lectures. AstroConnexions (AC): Gregorian or Julian dates? John’s 17th century chart for Culpeper is labeled 1616-10-18 J for the date of birth. The J signifying Julian, and therefore Old Style (OS). The time is given as 12:12:15 LAT (Local Apparent Time), Dorking, UK. The Asc is shown as 03Cap14, Moon 21Gem33. The Ascendant given in the lecture chart is 3:14 Capricorn, AstroConnexions gives 3:13 Capricorn. The Astro Data Bank website gives 7:12 Capricorn. 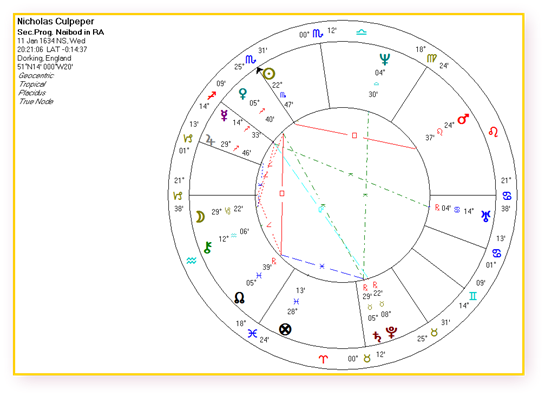 The Moon in the lecture chart is given as 21:33 Gemini, the AstroConnexions chart gives 21:32 Gemini. The Astro Data Bank website gives 21:41 Gemini. Note that the long and latitude are slightly different for the Astro Data Bank website calculation. Correcting this to Dorking does not alter their calculated Asc by a significant amount. Using the Solar Fire Gold (Windows) search capabilities, I brought up Culpeper’s supplied chart. Looks like they have the incorrect Gregorian Date. Adjusting the Solar Fire Gold chart gives the correct chart. We now have chart agreement with the Asc given by John, AstroConnexions and Solar Fire. The odd one out is the one from Astro Data Bank. In showing these charts from different vendors, I’m not trying to show which one is the best or the most accurate. Although that is something to be considered. Rather I’m showing the importance of checking dates, times and other factors. Culpeper’s 1634 progressed chart. Note the dates. Solar Fire’s date is Gregorian hence the 10 days later. When casting a secondary progressed chart John recommends selecting Naibod in RA or Mean Solar Arc in RA (both are the same). AstroConnexions uses zodiacal longitude. The difference is almost immaterial for the dates under examination. John’s chart gives an Ascendant of 21:38 Capricorn and a Moon at 29:23 Capricorn. AC gives 21:38, and 29:21 respectively. 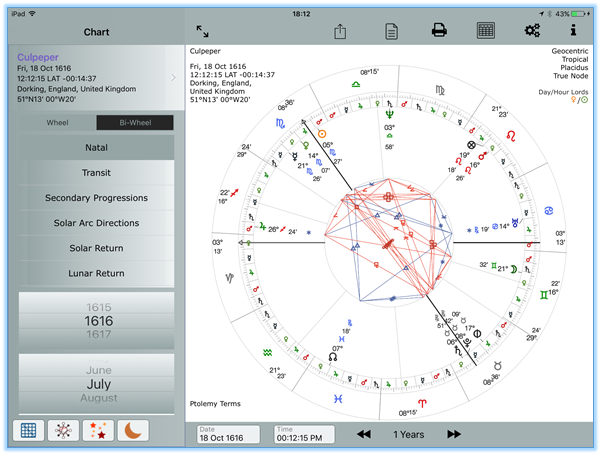 John also talks about the part of fortune and part of spirit – both are shown in the AC natal and progressed chart and are calculated in the usual way, ie not using their natal positions. As noted earlier one of John’s main topics is the close natal Sun-Saturn opposition. As an interesting note: the main progressed aspects to natal for 1634 are shown below (screenshot from AC) – read from left to right shows Saturn progressing to an opposition of the radical Sun. Something which is not mentioned in his lecture as far as I can recollect. Culpeper’s 1634 progressed chart showing the close Saturn progressed applying aspect oppose the Sun. This chart shows the POF and POS in the same positions as shown in the Mercurius Solar Return chart of 1633. I hope that I have been able to show that AstroConnexions can be used successfully to calculate historical astrology charts of various types. AstroConnexions software v1.2 for the iPad is available from the Apple app store.